My last day of guiding bike tours was filled with surprises. I was fortunate to have only two clients, and was able to conduct the ride like a private tour, taking them off the beaten path. A mile into the ride, Chris got a flat tire, my first and only flat of the year! While fixing the flat on the side of the road, I could hear leaves and branches rustling in the woods.....my client had wandered into the brush, taking photos. Suddenly, an enraged hunter, fully decked out in camouflage gear, appeared out of the woods aiming his rifle directly at my client, angrily shouting and cursing in heavy Florentine country vernacular. He was enraged. Terrified at first, I realized that Chris had interrupted a potential "kill" while snapping photos of the hunter at work. The hunterman wanted Chris to turn over his camera. I tried to explain to the hunter that Chris is a tourist, innocently taking photos, meaning no harm. I was trying to protect my client without becoming his dinner. I apologized over and over again, hoping that he would relax and put his rifle down. Thank God he did. It was the quickest and shakiest flat I've ever fixed. We were out of there! My real objective of that day was to ride through certain olive groves that I knew were already begining their raccolta (harvest). For all of Tuscany, this is a very exciting time of year. Last year was the first time that I experienced it firsthand, riding through the olives groves every day, watching them multiply and grow, preparing themselves to validate many a Tuscan dish. Last year's raccolta was robust and abundant. There were ladders and people perched in every tree, nets all over the place, baskets and baskets of olives being transported to the frantoio (press). The buzz of the harvest electrified the countryside. This year, the prolonged summer and lack of rain previsioned a meager harvest. As the months passed by, I could see that there weren't many olives on the trees, and those that were there were small. On this last work day, I was eager to catch some action, and I had to search it out. I took some side roads near Pisignano and alas, there we saw life in the olive groves, men and women in the trees, harvesting the olives. Always a sight to behold. Of course, we got off our bikes and asked permission to watch, and were welcomed with glee. On the invitation of one of the workers, my clients were invited to climb up the latter to help them pick! It was a blast and the clients were tickled with excitement. By the time we left, alot of smiles were shared and photos snapped. It was a great way to end the touring year. 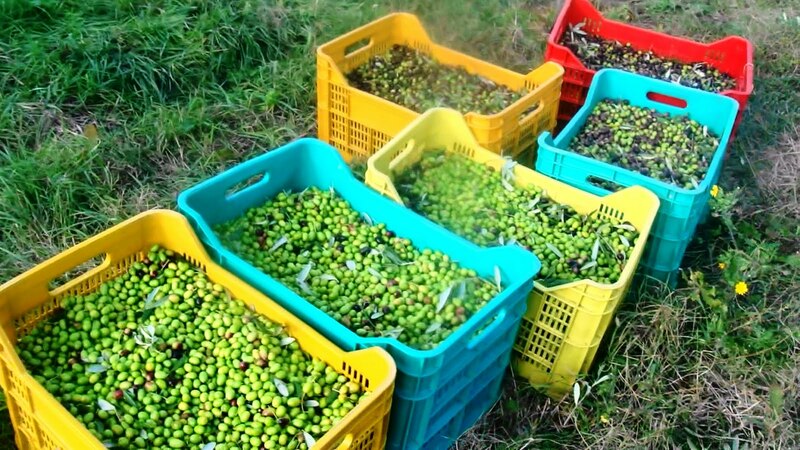 When we arrived at Le Corti, they too were harvesting the olives and I was able to explain the press while it was in action. We even tasted the newborn oil, as it poured out of the press. Here's the video I took! Can't wait for next year, but very content to get back to city life in Florence.